1. Drain the herrings, reserving the marinade. Drain and dice the beetroot, and place into a bowl. Add the capers, dill, red onion and herrings. 2. Add 2 tablespoons of the reserved marinade and the cream to the bowl, and stir well to combine. Cover and chill until ready to serve. 3. 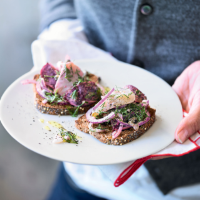 Spoon the salad and juices onto small pieces of toasted rye bread to serve.